I know I have said this before, but sometimes I dream about parties and all of the little details that go in to making them special. This is so one of those ideas! I brought to life something I’ve been dreaming up in this little old head… an easy and elegant wine bottle centerpiece. This all began with a picnic table… yes I know that sounds silly. See, I have wanted a picnic table in my backyard for some time now. Nothing fancy, just a regular old stained picnic table. I had visions of gorgeous dinners and time spent with family and friends. I finally convinced my husband that a picnic table was a must and off I went to Home Depot to pick up this little beauty. Isn’t she perfect? I bought her unfinished and added a coat of protective stain. I’ve already used her (yes, the table is a her) for an Easter party and many Spring lunches for the girls. It also gets used as home base and a stage on a daily basis. 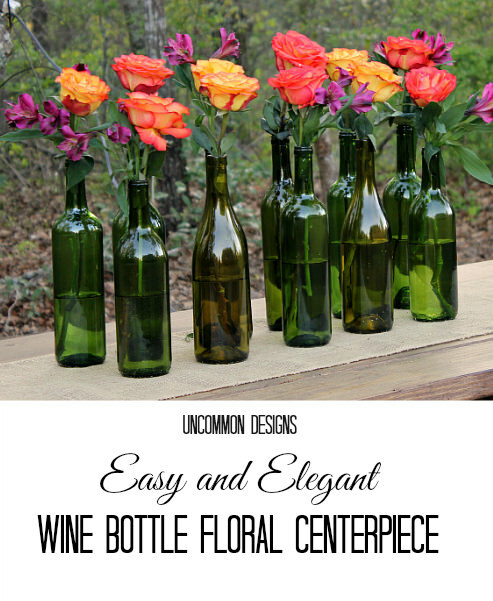 This wine bottle centerpiece could not get any easier to create. Gather your bottles, wash them out, and remove the labels. The bottles don’t have to match perfectly. In fact, I chose to use green ones and I love the subtle difference in height and color. They are beyond beautiful in the sunlight. 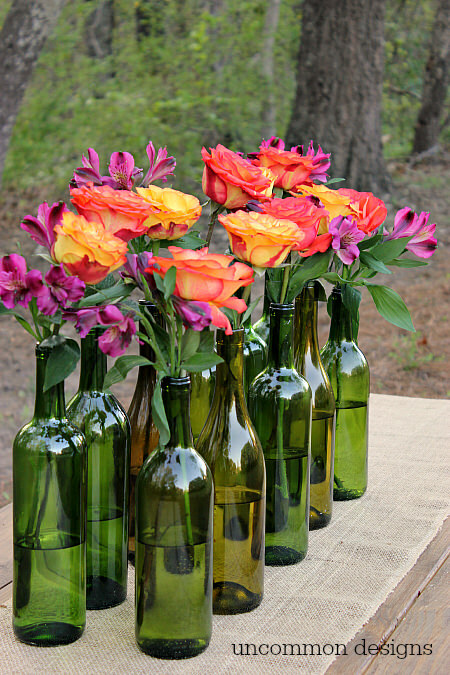 To finish up, fill the bottles to the same level with water and add flowers. I picked up a few bunches of inexpensive flowers at the grocery store and placed them in the wine bottles. I kept the stems long so they would remain tall in the bottles. I can imagine using these beautiful bottles for so many special occassions. You could even send them home with your party guests as a nice little treat to remember your special times spent together. Do you ever have crazy dreams of empty wine bottles and picnic tables… please tell me I’m not the only one! !